I had promised to catch up with you later in the process of mounting The Christmas Revels — and I guess strictly speaking this is later… only much later! As our royal carriage gallops further away from 2018 and our visit to Norwich with Will Kemp and Her Majesty the Queen, here are a few parting thoughts about this year’s sumptuous, boisterous, exquisitely melodious Elizabethan Revels. This show, as you know if you saw or participated in it, was large. Of course, every Revels is large, and by November the process feels like you are suddenly on a sleigh that has broken free of its driver. 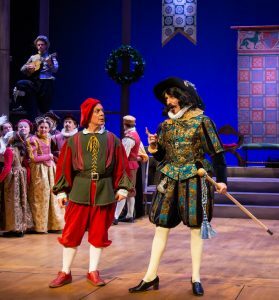 But this time around it took on an even grander scale — much like Gloriana’s amazing dresses (brought to us by way of the Oregon Shakespeare Festival) and Lord Chamberlain’s outlandish regalia (designed by our own incredibly talented Costume Team!). 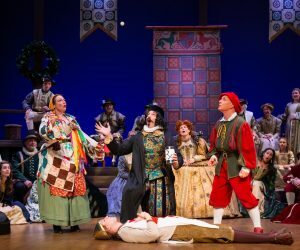 Our whole company was very involved onstage, notably in a crowd-pleasing scene where we rehearsed Shakespeare for our “Noble of Misrule” (an unsuspecting participant plucked from the audience). Each cast member had one line and then performed a hilarious “death” — even children, Morris dancers and Brass Ensemble fell out! This and other scenes, as well as the formal procession of the Queen and her entourage and our five dances, took quite a bit of stage rehearsal, which we did not begin in earnest until late October. 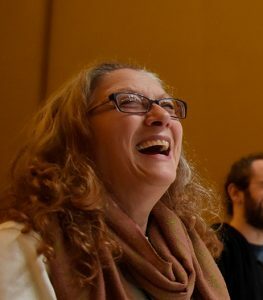 Most of this movement, or “blocking,” in the show is sketched out over just a few Fall evenings and three all-day rehearsals with the full cast. In November we put everyone into costume in a high school gym and run the entire show as we try out moving and singing for the first time in giant skirts, doublets, pumpkin pants and tights! But we really solidify all the scene work (and integrate the actors, who rehearse separately), instrumental features, musical accompaniment and choruses in our four-day “Tech Week” at Lisner Auditorium. Our set is loaded in and assembled on the Monday before we open and we are on it that night. We only plan to get through Part 1 on that Monday, setting aside Part 2 for Tuesday. Wednesday is our first full run-through and by that time the production elements are also (mostly) finished. It feels like a sprint, with jam-packed days! The technicians, carpenters, and sound and light crews arrive in the morning and the full cast arrives by 5:30 pm. And when does our day end? Well, the chorus is released at 10 pm. At that time, there is a nightly meeting for directors, designers, crew heads, and Lisner managers until 11 pm. Then we all go home and do it again the next day. No one ever said Reveling was easy! But it is FUN — and along the way dear friends and onstage families are born and thrive, often making connections that last a lifetime. We live and breathe Revels for this week, and you can feel it from the seats out front: pure joy and companionship! Monday, Tuesday, Wednesday rush by and then, after planning out the final staging on Thursday night (our full company curtain call) we get our first “practice” audience on Friday night during our annual free Outreach Performance for those who otherwise could not afford tickets — and we need them! 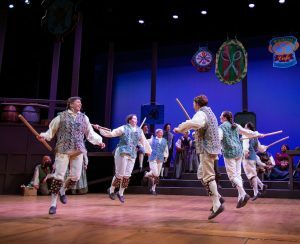 Once we have discovered how to navigate onstage, backstage, understage and lobby movement, we then practice responding to and connecting with our favorite people: each and every one of you who comes to experience Revels. We practice greeting you in the aisles, singing to and with you from the stage, waiting for your laughter and applause by suspending the action. Back in June we made our first company circle, and although it always seems like a lot of people at the time, we know it will get bigger and bigger — adding children and teens in September, production teams in October, specialists and musicians in November, and finally our December audiences, growing the circle to between 1,000 and 1,500 a night. All of us, reveling! The first weekend goes by in a whirlwind! If you think about it, this is the longest stretch of singing, dancing and acting we do. Sunday to Sunday, onstage for up to 5 hours per day. The endurance of our cast and crew, ages 8 to 88, is amazing! On the matinee days we arrive between 11:00-11:30 am and sometimes go home around twelve hours later! Everyone says it is one of the happiest times of the year — but yes, they are tired! Still, many manage to go straight back to school, to work, or to caring for their families during the week between the shows. But as tired as we all are, after a few days we start to feel antsy — anxious to get back to Lisner, wanting to sing and dance again, to meet the next 1,000 people, to spend time with our onstage family and backstage friends. During the second weekend of shows, there is often an impromptu cast after-party at a local pizza place. Everyone stuffs themselves into a party room, singing at the top of their lungs, laughing, and talking about all the wonderful people we have gotten to speak with in the lobby after dancing hand-in-hand with them in the iconic Lord of the Dance or after curtain call — people who may have driven hundreds of miles to see us or who have brought new friends or who have never seen anything like this and now want to audition! Our circle is wider with each of them and we are so happy to meet every one. Too soon the experience is over. On the final Sunday, with seemingly super-human energy and great good will, the company performs both a 1 pm and 5 pm show with less than an hour in-between. Then everyone helps to “strike” the set, props, costumes, hats and wigs, and unsold merchandise — loading it all out of the theater and into trucks, with some company members going back to the Revels studio to unpack it all. Folks take breaks to visit the Children’s Cast Party, hosted by parents at Lisner, and take a moment to talk to their Revels friends one last time before this world goes away. To the more recent Past! January 2019: By now our 105-person company is fully rested from the show, the holidays and our big Cast Party(! ), the set and props have been put back into storage, the costumes have been cleaned and hung in our costume shop or returned to the theaters that lent them, and any unsold crafts and CDs are stored in the cupboards. The long rehearsal days seem like distant memories. Thinking back on our eight performances warms our hearts and sometimes a melody or dance step comes floating back. Our staff pours over audience and chorus surveys, filled with valuable feedback about what worked and what did not. We conduct our annual DC “Revels Wrap-up,” a meeting where all the assorted directors, designers, managers, and staff get together to report out on the show. And, of course, we start planning for next year! For the first time in quite a while, the Rock Creek Morris Women capered to cheering Revels audiences as they challenged Will Kemp to a dance-off. It is always a joy to let Mark Jaster (Will Kemp) and Sabrina Mandell (Joan) loose on a stage — and when you add one of our favorite foolish guys, Danny Pushkin (Lord Chamberlain), and our Queen, Katrina Van Duyn, to the mix, the story that ties together an evening of music, dance and drama is magically set in motion. And, of course, we always love to hear from our most special guests — you! Thank you so much for sharing your thoughts with us. We hope we will see you at other Revels events throughout the year: our March Pub Sing; Jubilee Voices at one of their wonderful appearances at area heritage sites (including a late-February appearance in Upper Marlboro, MD); Gallery Voices at the Shakespeare Theatre Company next week; Maritime Voices as they perform at the FSGW Mini-Fest this weekend; our outdoor (weather permitting) May Revels on the first weekend of (what else?) May; Independence and Labor Day Parades; plus monthly Community Sings and Dances, World Story Time, After-School Workshops, and more! 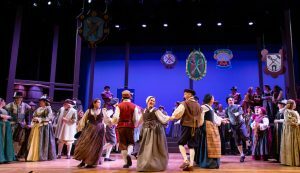 December is just over a month behind us, but we miss our Christmas Revels audiences already! Revelers love to Revel — to sing and dance and laugh together. So I hope you will consider joining us (why wait until next December?) all year round. P.S. Feel free to drop me a line about this blog or anything!